The drum filler unit is 36” wide x 40” deep x 68” tall. 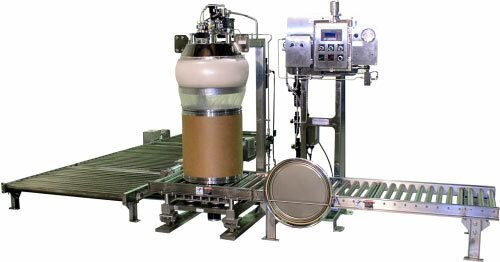 Includes 24” wide x 72” long gravity roller in-feed conveyor for drums. Includes three (3) sections of gravity roller pallet discharge conveyor for filled drums with actuated pallet stops. Unit is designed to fill 21”diameter x 24.5” tall drums with liner to a maximum capacity of 500#. System includes a 4” diameter, 316 stainless steel butterfly valve. Pneumatically actuated inflatable seal at the fill head creates a dust-tight seal to the drum liner inlet. Structure is constructed from 304 stainless steel with a #4 finish. The 316 stainless steel drum fill head includes a sanitary, electro-polished surface, continuous TIG welds, 4’ diameter fill tube, and 2” diameter sanitary flange, nitrogen purge and dust stubs. Unit includes a built-in drum top holder for easy drum closure access. Fill head inflatable seal constructed from FDA approved white gum rubber. The fill unit base includes a NTEP approved load cell package with hostile environment cables. Base of the unit includes a stainless steel pop-up densification frame with scale isolation. Unit includes a Metter Toledo digital weight indicator. Hoffman 4X control enclosure with Z purge and nitrogen pressure switch alarm for operator safety.